iDirect - Broadband satellite internet access using advanced router technology and traffic management. Customer terminals - Evolution� and iNFINITI� series. The customer terminal equipment comprises a stand alone satellite box (called satellite router or modem) connecting to the customers premise equipment, typically switch, router and local LAN (although this does not preclude operation with just 1 PC, directly connected). Most customers have a corporate wired or wireless LAN with a few or many PCs and other IP compatible devices attached. Your dish and outdoor transmit (BUC) and receive (LNB) radio modules are standard industry compatible units, the same as most other VSAT system. Your antenna size and its pointing will depend on the particular satellite used by your service provider. iDirect offer a range of customer modems (details here updated Sept 2010). Evolution� X3 uses DVB-S2/ACM standard. Broadband connectivity, Internet and VPN, VoIP and video conferencing. Evolution� X5 dual mode DVB-S2/ACM or iNFINITI� TDM on the outbound. specifically designed to support business-critical, broadband applications such as enterprise connectivity, cellular backhaul, maritime and other mobile applications. Evolution� 8000 Mobility and security requirements. Fast, reliable quality of service for military and government networks with Communications on the Move (COTM) and Communications on the Pause (COTP) applications. INFINITI� 3000 star-topology with IP data rates up to 20 Mbps downstream and up to 5.9 Mbps upstream. Small and medium-size enterprises. Basic voice, data and video applications. INFINITI� 5000 star, mesh and SCPC topology. IP data rates of up to 20 Mbps downstream and up to 7.7 Mbps upstream. AES encryption. 8 port ethernet switch. VPN, VoIP, Internet access, file transfer and video conferencing. INFINITI� 7000 star, Government and Limitary networks. Star, mesh and SCPC topology. IP data rates of up to 20 Mbps downstream and up to 7.7 Mbps upstream. FIPS/TRANSEC security. Regarding choice amongst the above you are strongly recommended to talk to service providers to discuss your requirements. If you are an end-user and want to buy a customer terminal or several customer terminals, go to my page satellite broadband: providers and navigate to find your region of the world and a satellite beam map and iDirect network covering of your location. The iDirect Technologies hub and remote hardware and software equipment provides connectivity for IP based services such as data, voice and internet connectivity. This Very Small Aperture Terminal (VSAT) network can provide data at speeds from 64 kbps to 4.2 Mbps from the remote site and up to 9 Mbps from the hub to the remotes. Each iDirect remote terminal includes a built-in router and is packaged with features such as link encryption, Transmission Control Protocol (TCP) acceleration, Domain Name Server (DNS) caching and Quality of Service (QoS) prioritisation all in one box. The iDirect system makes use of a number of inventions (patents applied for) covering their software and hardware components. These patent applications are for proprietary methods, apparatus and systems that impact such aspects as the allocation of bandwidth, quality of service, and network management/optimisation of iDirect's overall Internet Protocol (IP)-based broadband satellite technology. John Kealey, president and CEO of iDirect Technologies, said "The proprietary technology contained in these patent applications offers our customers real benefits by allowing them to better utilize their bandwidth and provide a quality of service level that is unsurpassed in the industry. The capacity and control provided by the iDirect IP over satellite technology is allowing our customers to provide services like Voice over IP and video conferencing faster, easier, and more profitably all over the world." If you are planning to set up as a satellite internet hub network operator read on..
Star topology networks are based on teleport sites with large dish antennas, These hubs generally provide a high speed outlink carrier (downstream) sending traffic to all remote sites. Remote sites generally transmit short bursts of data on a variety of frequencies (upstream). The hub rack, at the teleport, generally comprise one transmitter and multiple receiver 'line cards'. Some modems, INFINITY 5000 and 7000 permit mesh operation which means that remote sites may communicate directly with one another, rather than double hop via the central teleport hub. This is ideal for voice but the cost and complexity is higher. Mini-hub for a single network on a single satellite with up to 15 or 30 remote sites. Ideal for a company wishing to manage its own network as a Virtual network Operator (VNO). Larger hubs, such as 5IF, enable simultaneous operation on multiple satellites/beams. Large hubs permit the installation of many many line cards to serve many upstream links, e.g. 4 slot, 20 slot. A small network may comprise a 512 kbit/s downstream carrier and one 256k upstream carrier, all shared by 10 - 30 remotes. A large multi-network may comprise three 3 Mbit/s downstream carriers, on three different satellites, and ten 256kbit/s upstream carriers (and line cards) and perhaps 500 sites. There are several hundred hubs around the world service in excess of 10,000 end users customers. The hub racks are operated via PC screen and managed by service providers. For example, a company might install two 5IF hubs in leased rack space in several teleports and have 10 iDirect network beams over many countries, with all networks managed from a single small central office via data links. Staff training is very demanding and allowing one operator to manage many networks keeps overhead costs down. Any occasional physical attention to a hub may be done by the teleport/rack space hosting company.
. Interface with up to five different satellites through a single hub - no other system can do this! 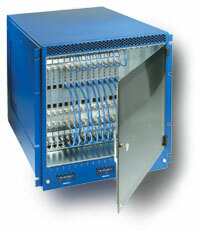 iDirect 20-Slot 5IF chassis covers up to five regions without purchasing and operating multiple hubs. It's designed for network operators who offer service on multiple satellites, allowing access of up to 5 satellites from a single chassis. A single 5IF chassis can support aggregate speeds up to 360 Mbps, and multiple chassis can be configured within the same hub. The chassis supports C, Ku, and Ka band transponders with carrier class redundancy. The 5IF chassis many be rented out to 5 separate companies, each of whom may then operate as an independent virtual network operator (VNO), see below. Each VNO rents their own uplink carrier and TDMA downlink carrier on the satellite. 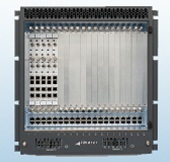 iDirect 20-slot 1IF chassis saves invaluable collocation space. It's designed for network operators with full teleport capabilities provided over a single satellite. Like the 5IF chassis, the 20-slot 1IF allows up to 20 networks from a single hub, and also supports aggregate speeds up to 360 Mbps. iDirect Mini Hub is an ideal solution for corporations that need a small network under their own control. The iDirect Mini Hub provides a single inbound/outbound network via satellite. This cost effective native IP replacement of frame relay networks can support bandwidth of 18 Mbps downstream, and 4.2 Mbps upstream. The Mini Hub comes with comprehensive network management software. If you are an end-user and want to buy a customer terminal or several customer terminals, go to my page satellite broadband providers in Europe and navigate to find your region of the world and a satellite beam map covering of your location. If you are a telecoms service provider business and are considering buying a VSAT hub, for more information about buying hub equipment please email pr@idirect.net. I you are concerned regarding the operation of your iDirect remote sites it is now possible to monitor the status and traffic flow etc of those site using a virtual NMS service available from Nynex (free of charge at Dec 2010). All you need to do is register to their server, download the collector software and put it on your remotes and then you can see how they are working. You do not need to be a customer of Nynex. Go here for more information: Monitoring iDirect remote sites. The information and images on this page are based on copyright information derived from the iDirect web site and are reproduced here with permission. Please click this link: iDirect, to go to their web site for further information and more contact details. They may have local office nearer you. Page started 10 June 2004, last amended 5 Feb 2015.